'Common Thread' (Thomas Johnson, R. 2012) Seedling# TZ218AA. TB, 36" (91 cm). Early midseason bloom. 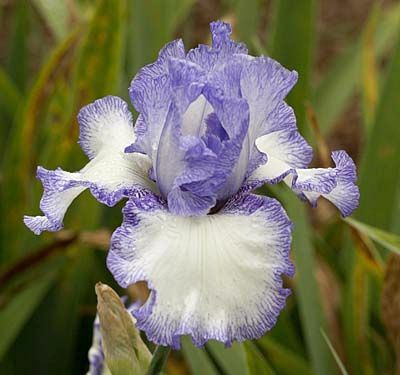 Standards white, lavender blue plicata stitched edges; style arms medium blue; falls white, precise lavender blue plicata edge; beards lavender tipped white; slight fragrance. 'Ink Patterns' X seedling# TW92D: ('Crowned Heads' x 'Blackberry Tease'). Mid-America 2012. Honorable Mention 2015. From Mid-America Garden catalog, 2012: COMMON THREAD (T.Johnson ‘12) TB Early-Midseason 37” (94cm). The Common Thread is the precisely stitched lavender bands on a sparkling white silk background. Wide, nearly overlapping falls help create a big, billowy form that makes sure Common Thread won't be overlooked. Growth is strong and disease resistant. Well-branched stalks have 3 branches and 8-9 buds. Sdlg. TZ218AA: Ink Patterns X (Crowned Heads x Blackberry Tease). $50.00.